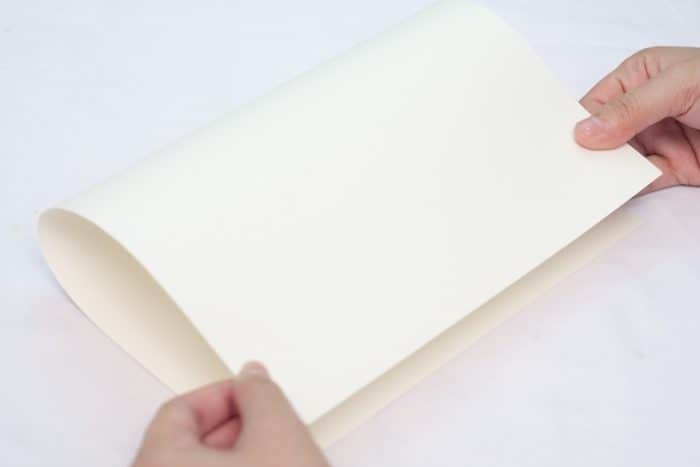 Nothing says I love you, Sweetheart like a card or gift that you made by hand. This tuxedo card makes an adorable Valentine’s Day card, anniversary card, or a cute prom asking idea. 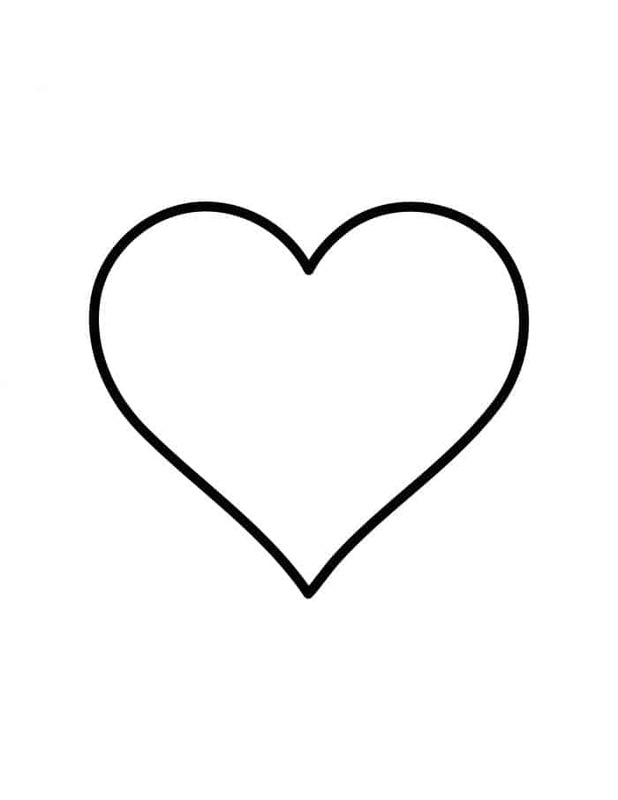 Use the free printable heart template below and you won’t even have to freehand anything! It’s easier to freehand, but if you’re someone like me who can’t even draw a stick person, a heart template is nice to have. Step 1: Create a pattern. 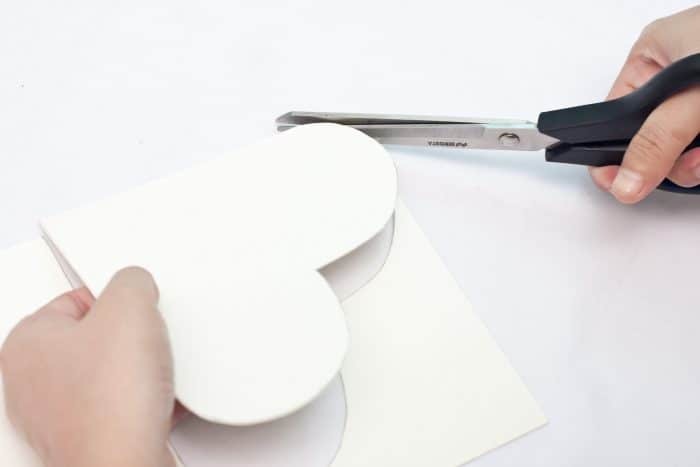 You can either freehand a heart on a piece of cardstock or cardboard use this free printable heart template to print your template on cardstock. 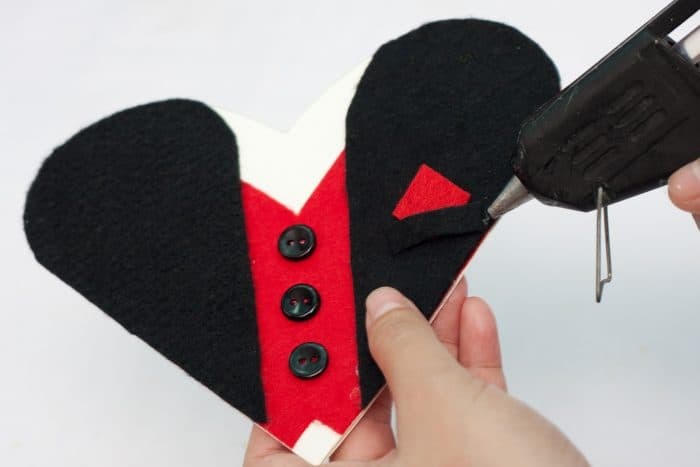 Whichever you choose, you will be using this heart template to create both the base of the tuxedo card and the felt pieces to glue on it. Step 3: Using the heart pattern, trace the heart to the folded cardstock as shown making sure to place the left edge of the heart along the fold as pictured. Cut out the heart. 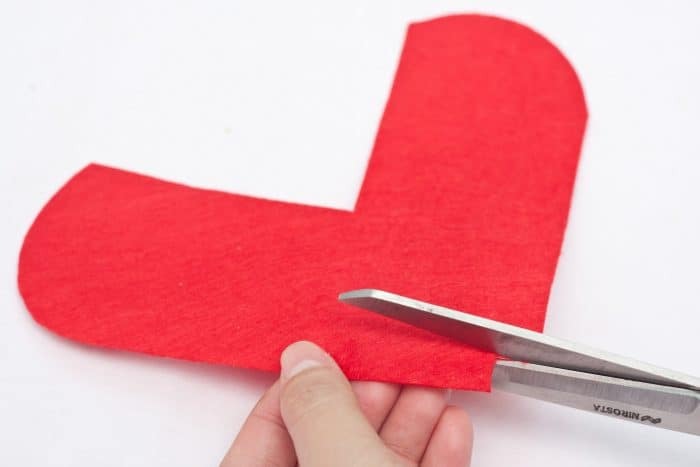 Step 4: Using the same heart pattern, cut another heart from a piece of red craft felt. This will be the vest of the tuxedo. Step 7: Cut a small triangle on the mid-bottom part of the heart. 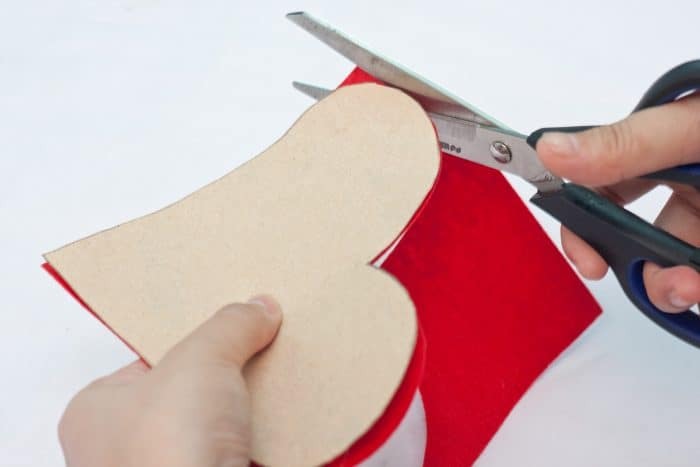 Step 8: Align the red felt heart to the cardstock heart and hot glue it. 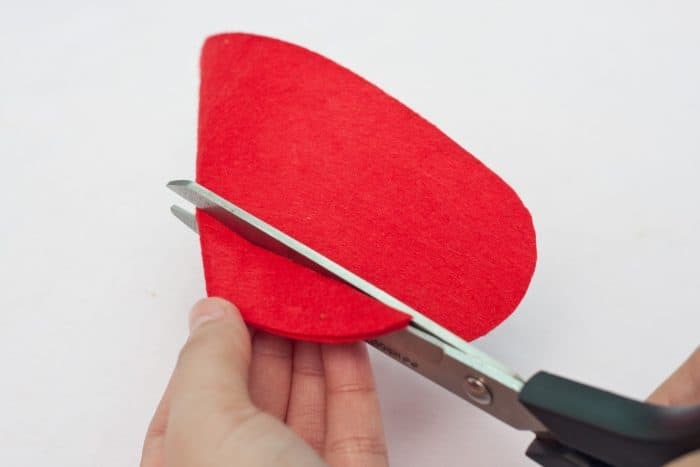 Step 9: Use your heart template to make a black felt heart as you did with the red felt and then trim as desired from there (see photo below). Hot glue the black felt pieces as shown. Step 10: Glue the three black buttons on the middle of the vest. Step 11: If you want to give your DIY tuxedo card a little something special, make a pocket square! Fold a triangle from a small red felt. 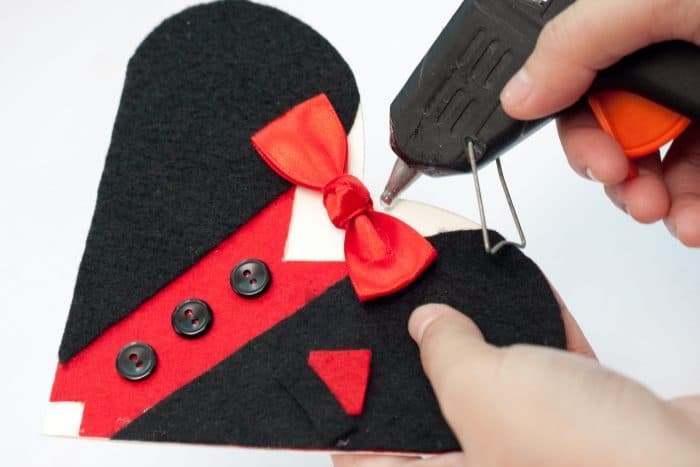 Add a small strip of black felt below the red triangle and glue to the upper right breast of the tuxedo. Step 12: Cut 5 to 6 centimeters of red satin ribbon. 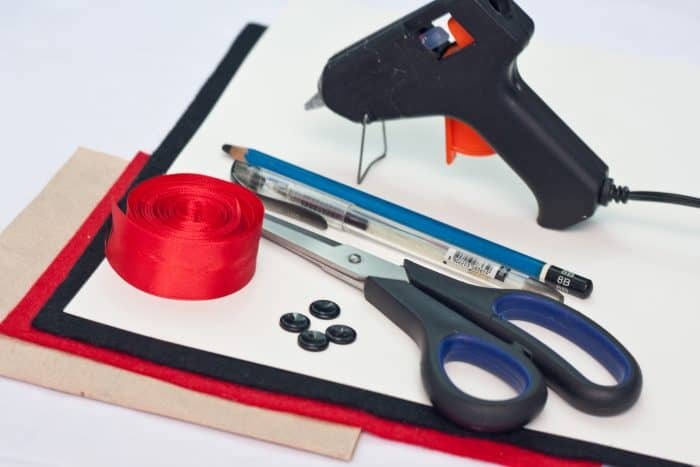 Meet both ends of the ribbon at the center of it and secure it with glue. Step 13: Cut another small strip of red satin and make a loop from it. Pinch the ribbon and tie it at the center using the looped strip of ribbon. Glue the bow now on the topmost part of the red vest. You’re all set! Just add a message and give your heart away. What else will you make with the free printable heart template in this DIY? The possibilities are endless. 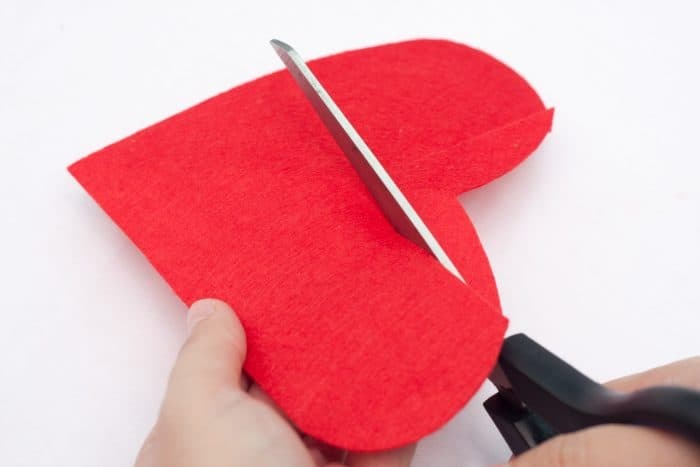 Using the same heart pattern, cut another heart from a piece of red craft felt. This will be the vest of the tuxedo. Cut a small triangle on the mid-bottom part of the heart. 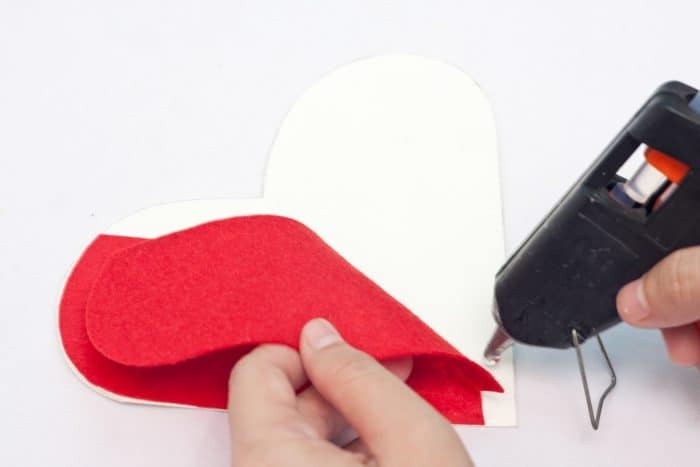 Align the red felt heart to the cardstock heart and hot glue it. 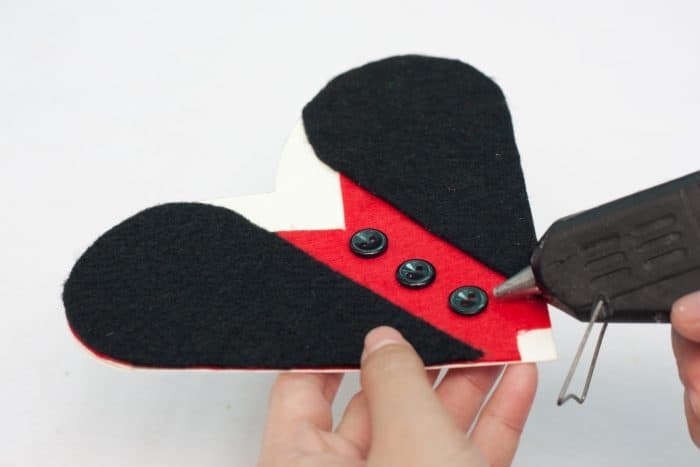 Use your heart template to make a black felt heart as you did with the red felt and then trim as desired from there (see photo below). Hot glue the black felt pieces as shown. Glue the three black buttons on the middle of the vest. Fold a triangle from a small red felt. 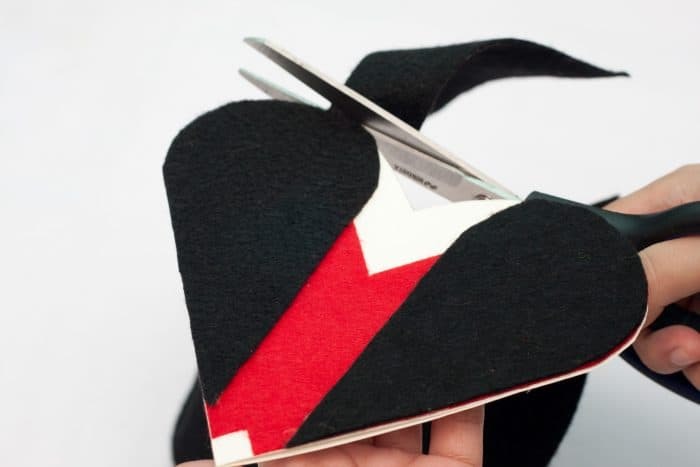 Add a small strip of black felt below the red triangle and glue to the upper right breast of the tuxedo. Cut 5 to 6 centimeters of red satin ribbon. Meet both ends of the ribbon at the center of it and secure it with glue. Cut another small strip of red satin and make a loop from it. 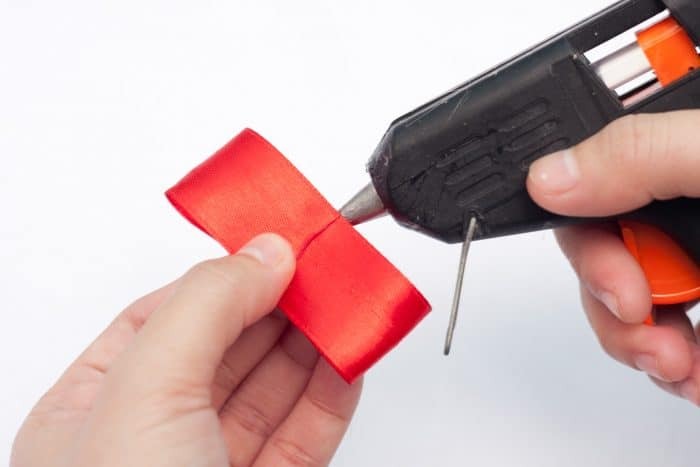 Pinch the ribbon and tie it at the center using the looped strip of ribbon. Glue the bow now on the topmost part of the red vest. No time to craft? Check out these 10 free printable birthday cards.